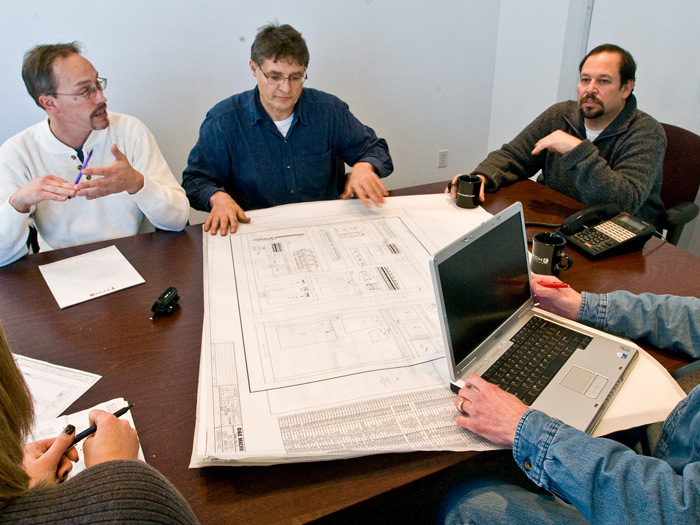 After decades of experience in design and engineering, we know automation, and we use all available equipment and technology to create the best solution for your needs. Our electrical design engineers specialize in designing industrial control systems. We have worked with many refineries across the world and have overcome many challenges. Each success has further equipped our staff to offer the most creative and effective solutions for your automation requirements. Contact us today to learn how Tech4 can meet your design needs. Monitor and control your machinery at all times with Tech4’s C&M programming. We’re electrical experts, and we consult with you on the control aspects to ensure that they meet your equipment’s threshold specifications. Our engineers are familiar with control equipment and rotating machinery of all kinds including gas turbines, steam turbines, and motor drives for compressors. For example, in a compressor, we build control and monitoring systems that safeguard its operation and monitor the temperature and vibration in the bearings, lube-oil temperature, stress levels, and process parameters and shut it down if the operation exceeds safe levels. Tech4 specializes in providing controlling, monitoring, and programming for rotating equipment of all kinds. We’re adept at interfacing your DCS and SCADA with the Unit C&M systems, ESD systems, and SIS. When something goes wrong, your ESD system needs to be part of the solution. Here at Tech4, we custom program and build many different types of ESDs*. In the programming, we itemize the issues so our clients can recognize what’s wrong, isolate the issue and resolve it to get the process back up. We design the ESDs to respond differently to unique issues so an entire plant isn’t shut down for something trivial, but instead, they will shut the plant down in the event of a serious issue with danger of an explosion. Whether you need a complete ESD package, or just the programming, we have a fast turnaround time to quickly meet your needs. * We have worked with ISA, OSHA, and other government agencies and will program the ESDs as per their requirements. Access information; control the process; control your machine. Every refinery has its own communication network, and Tech4 is flexible and knowledgeable to adapt a control system solution to any network. We can help boost your industrial efficiency by using just a single terminal connected to your network to program all the PLC controllers on all links of your network. We have implemented hundreds of unique combinations over the years and we know what works and what doesn’t. We’re committed to providing the best solution, free from bias. We only recommend products we have thoroughly investigated and successfully applied. Component placements and where to mount them. Tech4 specializes in fabrication of custom control systems that need more than a cookie-cutter approach. If a system needs to fit a specific enclosure, we fabricate it to the exact specifications. If the control system needs specific calibration, we custom integrate it into the system.